(Phys.org)—A regional dust storm on Mars, tracked from orbit since Nov. 10, appears to be abating rather than going global. "During the past week, the regional storm weakened and contracted significantly," said Bruce Cantor of Malin Space Science Systems, San Diego. Cantor uses the Mars Color Imager camera on NASA's Mars Reconnaissance Orbiter to monitor storms on the Red Planet. 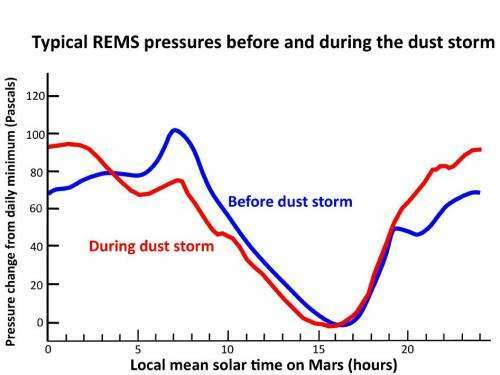 Effects of the storm on global air-pressure patterns have been detected at ground level by the Rover Environmental Monitoring Station (REMS) on NASA's Mars rover Curiosity. "We are getting lots of good data about this storm," said Mark Richardson of Ashima Research, Pasadena, Calif. He is a co-investigator both on REMS and on the Mars Reconnaissance Orbiter's Mars Climate Sounder instrument, which has been detecting widespread effects of the current storm on atmospheric temperatures. 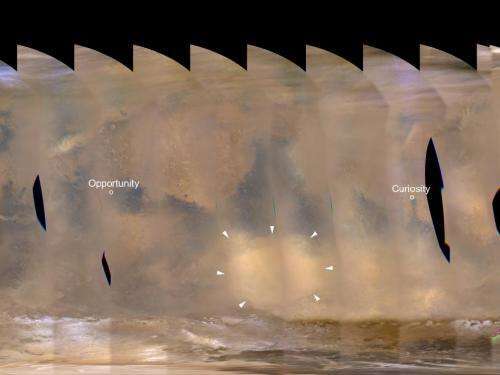 Researchers anticipate that the unprecedented combination of a near-equatorial weather station at ground level, and daily orbital observations during Mars' dust-storm season, may provide information about why some dust storms grow larger than others. More information: For more information about the missions of NASA's Mars Exploration Program, visit marsprogram.jpl.nasa.gov/ .